In September, I wrote about my experience at Stitch 'n Pitch at Shea Stadium; prior to the game I had read a press release about Save The Children and Warm Up America's Knit One, Save One campaign and thought that yarn would be provided to work on these caps during the game. Unfortunately, that was not the case; the instruction kit was handed out, but no yarn, so I had to work on these at home. The instruction booklet has directions for both knitting and crochet, for beginners and intermediate skill levels. I decided to crochet mine using yarns from my stash and I've been working on them on and off since October. They aren't as beautiful as some of the others on the web site, just simple solid color caps. But I'll bet they'll get the job done. 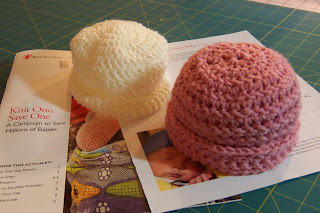 The instructions for making the caps were available for download as part of the Action Kit from the Knit One Save One web page. While you're at that page, you can also watch a video about the program, which is part of Save the Children's Survive to 5 program, play the Celebrity Caps Game, and get inspired by caps made by last year's participants. If you'd like to participate, you've got until December 31 to make a cap and mail it in. If you can't make a cap, you can make a $10 donation online toward a Newborn Care Kit.